The Carolyn Glasoe Bailey Foundation and Porch Gallery Ojai are pleased to announce the Thomas Fire Artist Recovery Fund, a grassroots initiative to raise, match, and distribute unrestricted cash grants to members of the Ventura and Santa Barbara Counties’ creative communities seriously affected by the Thomas Fire. The Thomas fire, which started on the evening of December 4th is now the fourth largest in California History and still active in Santa Barbara County. The first phase of the Thomas Fire Artist Recovery Fund is to gather more information about the impact the fire has had on our creative communities, as well as the scope of need. As members of the Ojai and Ventura communities are now being allowed back to assess the damage, we thought this would be a good time to begin reaching out to determine the scope of impact. At the end of 2017, we will determine a fundraising goal based on the information we gather. As we actively reach out with our existing networks, we ask that anyone who may be affected or know those affected to complete a very short questionnaire. 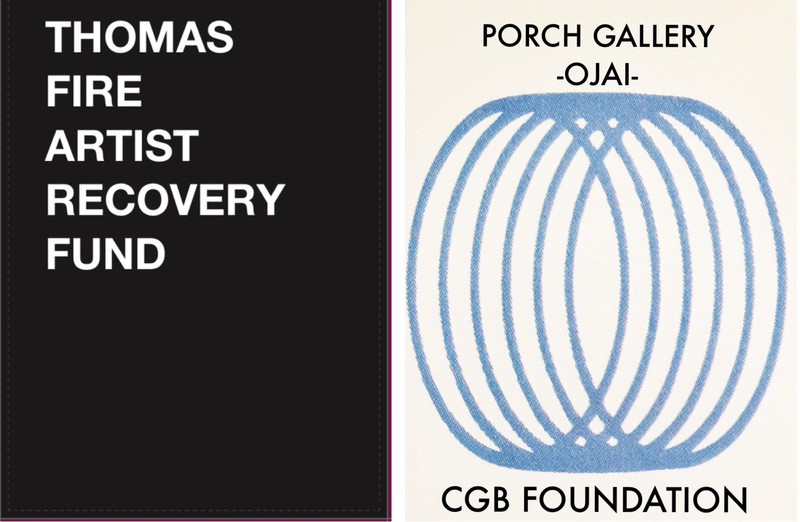 The second phase of the Thomas Fire Artist Recovery Fund will be two-fold: a matched fundraising campaign led by the Carolyn Glasoe Bailey Foundation, including a public program of free and ticketed events, and a fundraising art exhibition hosted by Porch Gallery Ojai featuring art works donated to benefit the Fund. Please save the following dates for the Thomas Fire Artist Recovery Benefit Exhibition: February 1 – March 11, 2018. A public opening reception will be held on Saturday, February 3 from 5-7pm. Complete list of participating artists to be released in January 2018.